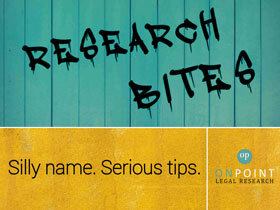 We will be continually adding morsels of legal research tips to this page- click on the heading to read more. Charterpedia is a great starting point for considering claims involving the Charter of Rights and Freedoms. It provides information about the purpose of each section of the Charter, the analysis or test developed through case law in respect of the section, and any particular considerations related to it. Each Charterpedia entry cites relevant law, and citations to Supreme Court of Canada decisions are hyperlinked whenever possible. But What Did That Statute Used to Say? Often we need to know what a statute said at a particular point in time. One quick way to look up former version of a statute is through BC Laws’ online “Archived Statute Consolidations”, available on the BC Laws’ homepage (www.bclaws.ca). This tool allows you to quickly look at a statute at various points between 1991 and today. While this doesn’t guarantee that you have the exact wording on a particular day (though other parts of BC Laws can), it is one of the fastest ways to see how a statute has changed over time. There is even one for regulations, going back to 2003. Robichaud's Criminal Defence Litigation (https://robichaudlaw.ca/) out of Toronto has moved many of its criminal law precedents online for lawyers to access, read, and download for free. While all precedents must be used with care and adapted and revised as appropriate, this database is a great starting point for everything from arrest to sentencing. Hull & Hull LLP, a law firm out of Ontario, has an excellent blog with short, regular updates on substantive and procedural issues. You can subscribe and receive emails of posts to keep up to date on developments in the field. Visit https://hullandhull.com/blog/. In October 2018, the BCCA's new practice direction on frequently cited authorities came into effect. It lists the authorities that parties are not required to produce in full in their books of authorities. Thomson Carswell released the 9th edition of the Canadian Guide to Uniform Legal Citation in 2018. It includes several updates, but the one of most interest is the direction to drop the parallel citation when you use a neutral citation. This is now consistent with BC Court of Appeal practice, which adopted this approach in a 2013 Practice Direction. Unfortunately, "noting up" a specific legislative provision frequently fails to capture all the cases that have considered it. To be on the safe side, it's a good idea to run a case law search for a specific set of words taken directly from the provision that you're interested in, as well as a second keyword search for the name of the Act (or Regulation) appearing within a few words of the section or rule number. Hate it when your paid subscription to a caselaw database doesn't provide you access to that English case from the 1800s? Often, you can find that case quickly through www.lawcite.org. This is an internationally generated legal case citator with over 15,000 Law Report and journal series. BC lawyers can also access HeinOnline for free through the BC Courthouse Library Reading Room, which contains English Cases from 1220-1865.